How Can I Bring My Kitchen Design Ideas to Life? 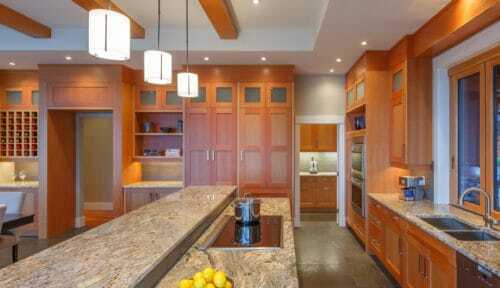 | Cabinet FAQs | Merit Kitchens Ltd. Your home is a reflection of you and your family. And with renovation comes an opportunity for increased personalization – to create a space that reflects your style and complements your lifestyle. But creating a design that’s a true reflection of your lifestyle can be a daunting, intimidating task. . The right idea can bring your kitchen design together, but where does one find them and, more importantly, how does one make them happen? We are here to help. From the kitchen to the bathroom, cabinetry design extends well beyond basic functionality. Aesthetics are critical to creating areas in your home that offer a place of rest and recovery after a busy day. Do you feel most at ease in rooms that feature warm, rich colors? Or maybe crisp, clean minimalism helps you relax and refocus. To begin the discovery process, just look around you for sources of inspiration, including your wardrobe, favourite travel destinations, hobbies and types of architecture you find inspiring. 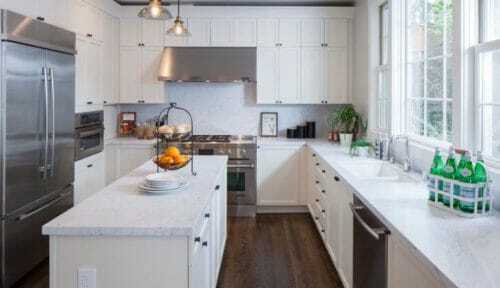 Being able to identify and describe some of the most prominent styles is important to being able to bring your kitchen design ideas to reality. Popular styles to consider include contemporary, traditional, transitional, modern country, luxe and global. 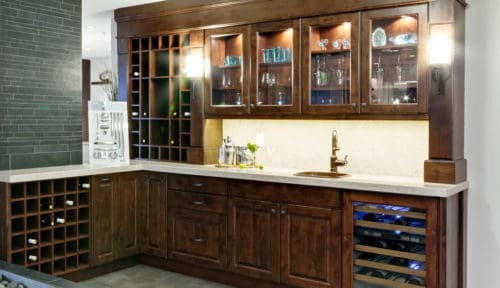 To see examples of some of the most popular styles of cabinetry, we invite you to look through our photo gallery of cabinetry for the whole home. We’ve collected our favourite designs for kitchens for your inspiration. We have the designs to inspire you and set your mind in motion – from the contemporary to the traditional. 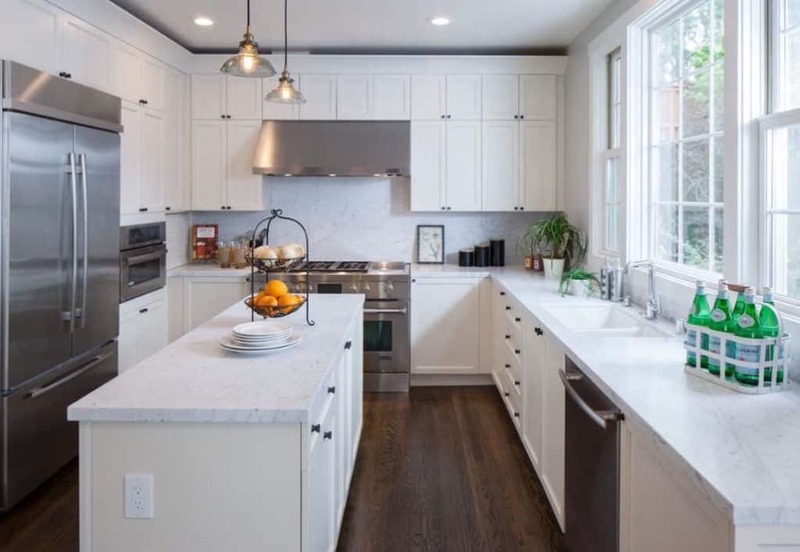 Every cook's dream – this white kitchen showcases stacked cabinets and professional appliances. 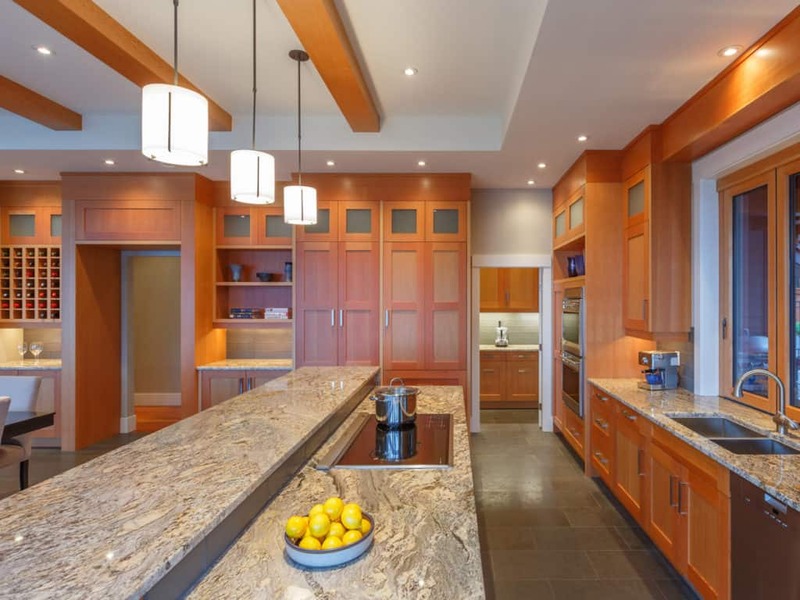 The expansive two-level kitchen island in this superb space provides an area to entertain and cook. 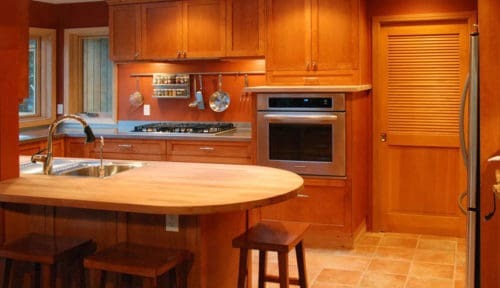 The beauty of natural wood is celebrated in this Shaker style, Maple kitchen. 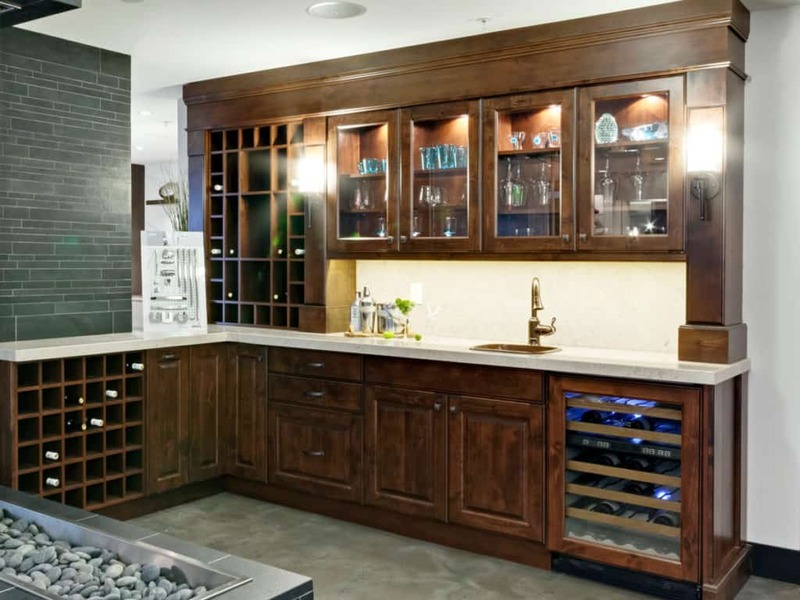 This tailored home bar features Knotty Alder cabinets, a paneled wine fridge, and custom wine racks. 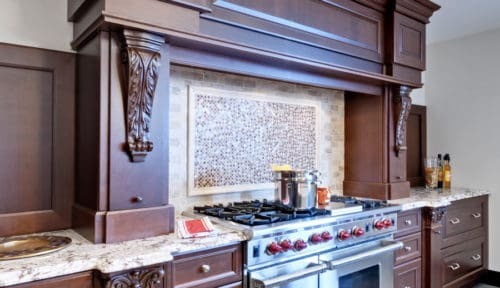 A large kitchen calls for a grand focal point: this elegant, Cherry wood hearth is an eye-catcher. 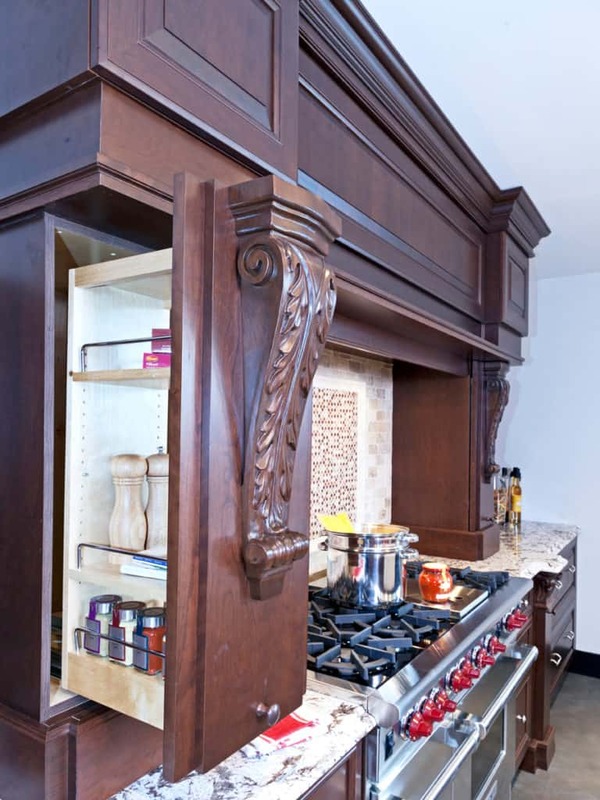 Storage can be skillfully concealed behind decorative elements, such as these hand-carved corbels. Each of our gallery images highlights a real kitchen, one that can be transformed to fit into your home. Feel free to contact us. 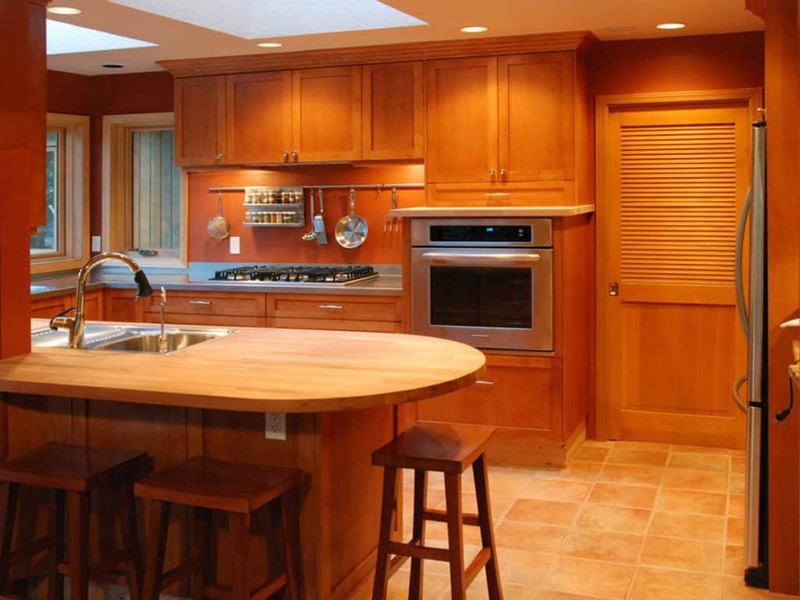 One of our designers will help you bring any kitchen design idea to life. For those who already have the perfect design in mind, we’re here to make sure each component meets your standards; no need to compromise to the limits of pre-fabricated kitchens. That’s why each of our kitchen products is built-to-order. Every cabinet, drawer, storage unit and so on is cut to fit into the exact space of your home’s kitchen. Door Styles We have a range of different styles for all of our cabinets. Species & Finishes From light to hardwood, there’s no need to compromise on the weight and feel of your cabinets. Ensure that your cabinets match the overall design of your kitchen by choosing from among our different finishes. Space Optimizing Solutions Finding space for everything in your kitchen can be a constant battle, our storage solutions can make it just that much easier. 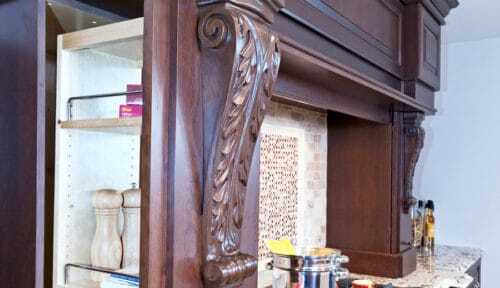 Decorative Cabinets Everything will come together perfectly with our different decorative moulding and wood. And if you are looking for glass doors for your cabinets, choose from one of our stylish designs. Sometimes pictures can only go so far to elicit an experience. That’s why we’ve developed an interactive virtual showroom. 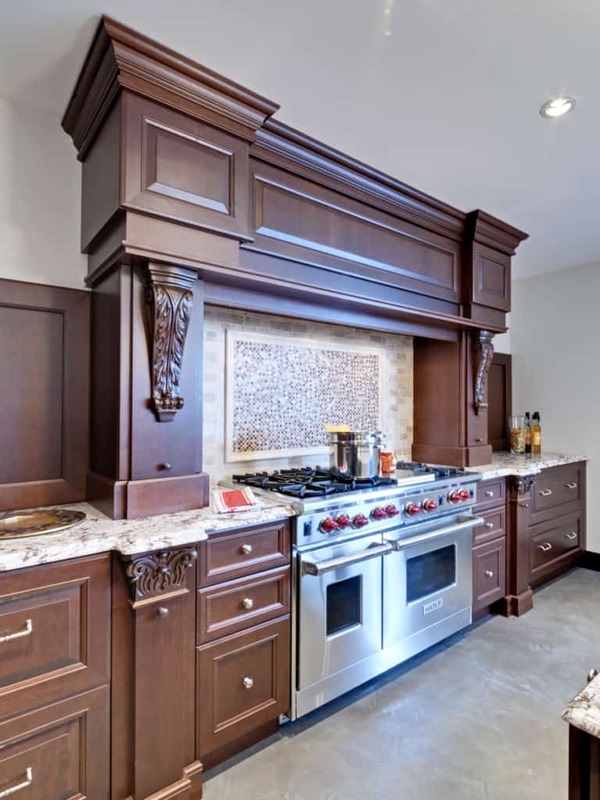 Viewable in your web browser, get a close up look at some of our contemporary and traditional kitchen design ideas brought to life for your home. Finding a reliable and market-leading manufacturer who can transform your kitchen design ideas into reality can be a challenge. Selecting Merit Kitchens as your kitchen cabinet manufacturer means you are choosing to work with some of the most talented people in the industry. Founded in Vancouver, British Columbia in 1971, we’re a world-class supplier of kitchen and bathroom cabinetry in Canada, the United States, Central America and parts of Asia. Using only premium, environmentally friendly materials and offering a limited lifetime warranty on all of our products distinguishes us from others, but it’s our approach that makes us proud. If you have a kitchen design idea cemented in your mind or still looking for some inspiration, simply contact us to find a dealer near you. Our diverse team of talented tradespeople, designers, technical specialists and customer service representatives take pride in bringing kitchen design ideas to life.